Stormy weather has arrived at the farm and it has hit us pretty hard. A few large trees went down on Friday (luckily very minor damage!) and the rain has continued to fall for 3 days straight. It’s been wet and muddy in the fields and coming inside to take a hot shower has never been more enjoyable. Seriously, as the hot water rinses the mud off my bare skin it feels like the most enjoyable spa experience of my life. This past Saturday we attended our 24th Hood River farmers market of the 2016 season (with 5 more markets to go). It was the stormiest day of the week and we were so thankful to folks who braved the crappy weather and came out to support all of the farmers who worked their tails off harvesting food for the market. We all knew it wouldn’t be a great turn out due to the conditions but despite the rain, it ended up being a lovely morning surrounded by awesome people who just so happen to be as hungry as we are for the flavors of the season. We all huddled together (rotating between each others tents) passing around hot mugs of coffee, tea (and a few other beverages guaranteed to keep cold and wet farmers warm–thanks Brynden!) And when we all looked past the umbrellas, rain boots and slickers we were able to gawk at all the booths filled with a rainbow of carrots, beets, winter squash, tomatoes, potatoes, lettuces, onions, greens, roots, herbs, mushrooms…you name it and it was there! The scene was absolutely beautiful even on the gloomiest of days. After standing in the rain for 4 + hours we we’re pretty stoked to come home and whip up this incredibly flavorful and nourishing stew. We have our good buddy Colin to thank for contributing the most important ingredient in this recipe–the mighty Chanterelle Mushroom! Not only is Colin (and his lovely wife Kristin) the master of fermentation (check out their amazing products here) But Colin is an exceptional mushroom hunter. Every spring and fall he forages wild mushrooms and we are lucky enough to trade Tumbleweed Farm veggies for the treasures he finds in the Pacific Northwest woods. This is a lovely stew to make when a storm’s a brewin’ and you are seeking comfort and nourishment from the coziness of your own kitchen. Pair with a glass of wine and you’ve got yourself the perfect date night in on a stormy night. Cheers from Tumbleweed Farm! Heat the oil in a large, heavy bottom pot over medium-high heat. Add the onions and cook, stirring occasionally, until fragrant and tender, about 8 minutes. Add the mushrooms and continue to cook, stirring occasionally, for about 8 minutes longer. Stir in the thyme and cook for 1 minute longer. Add the wine and bring the mixture to a boil. Boil until the mixture is reduced by half, about 1-2 minutes. Add the veggie broth, potatoes, squash and soy sauce. Cover the pan and simmer until the vegetables are tender, about 25 minutes. Stir in the spinach and continue to cook until the spinach turns bright green and tender, about 3 minutes. Use a slotted spoon to remove about 1/3 of the squash and potatoes and lightly mash them. Return them back to the pot and stir well. 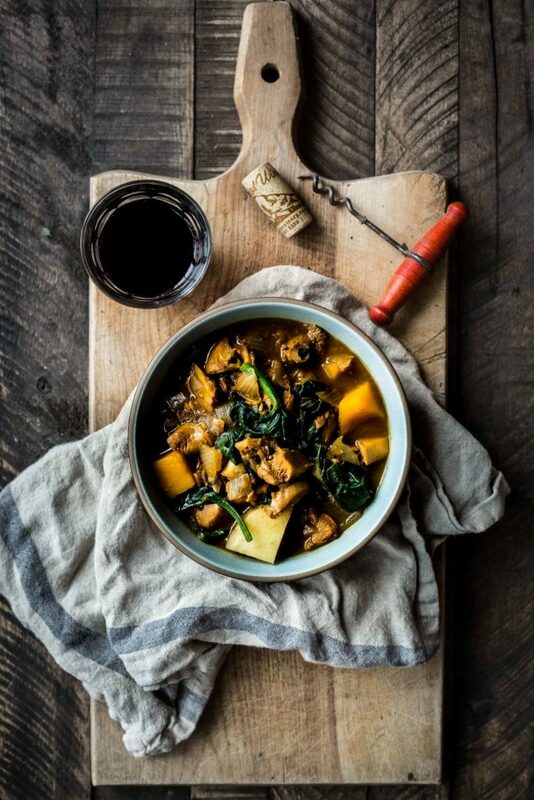 Dived the stew between bowls and serve with crusty bread and a glass of wine.